We are excited to re-introduce players to the Undine, or Species 8472, as they are known from the Star Trek: Voyager TV series. 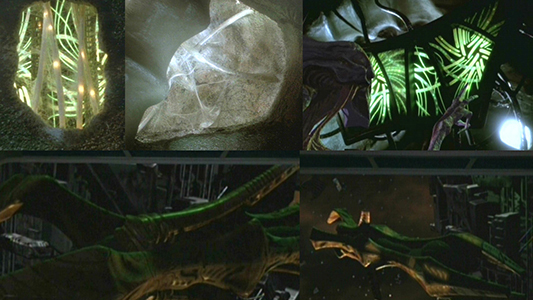 The species first appeared in the VOY episode, “Scorpion” and have existed in a small number of STO missions for quite some time. 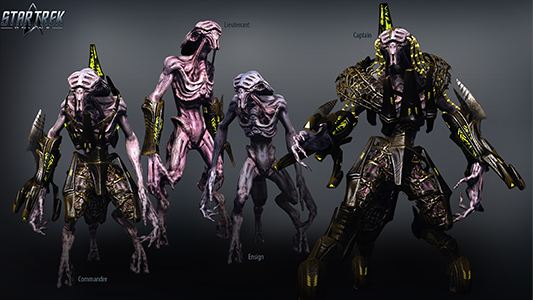 However, in the game, though their bodies were heavily referenced from the show, their original armor was not, as Species 8472 was never shown with any attire. As we started delving deeper into the Delta Quadrant we decided it was time to re-evaluate the Undine group in our game. First off, their bodies were very blurry and lacked detail. By far, this was the easiest part of the revamp. A little texture sharpening, and a few skinning tweaks and Bam! The new version looks like an up-rezzed character. Next, we felt the armor didn’t quite match the design sensibilities we’d expect from this species based on what was seen on the show. As seen below the armor felt very thick and heavy. Things like the gauntlets and leg plates have almost gladiator-like attributes and there didn’t seem to be any influence from the tech from the show. But why even put on attire of any sort to begin with? Part of the reason is STO has developed a visual language for enemy groups to help players discern different ranks quickly and easily. Some of the most effective ways to achieve this is through the use of visual complexity, size, color, and silhouette. Also keep in mind that the game camera is often in a perpetual long shot of the action - there isn’t the same room for subtlety afforded to the shows. Attire is one of the easiest ways to grant us the visual breadth we need. For the Undine, we also want to enforce the idea these creatures are highly intelligent – not beasts. Again, with the arguably limited storytelling and dramatic cinematics of STO, we rely on more overt visual cues…and techy bits, armor, etc. can do just that. That decided, what should their attire look like? We went to the source and gathered everything we could from the shows; some key examples are included in the picture below. Without a doubt, the Undine are all about Bio-tech. We took special note of quite a few details. Shapes are organic and there are hardly any straight edges, yet the ships have symmetry and very intentional looking grooves. They also have a distinct 3-pronged look. It all looks almost grown, but in a very controlled and often ordered manner. There are also a lot of tubes and glow-y bits that help to encourage the feeling of “technology” amongst the natural bony surfaces. These guys are also very lithe. They are definitely strong, but very thin, bendy, and nimble looking. Again, the original armor felt way too heavy for their personality. Taking what we’d learned and what we wanted to achieve, we entered the concept phase. The image below shows the first handful of extremely rough conceptual explorations with the final version on the right. With the new design in place, we created the new in-game version, complete with optic cables that have animated, scrolling textures. A final note on the creation of the Undine armor, we built it to fit conventions similar to uniforms with parts such as “belt”, “chest gear”, “boots”, etc., as well as a couple variants on key parts…and the ability to color tint. This modularity allows us to create the range of rank (as seen on the first image) from Ensign, which is bare, to the Captain, which typically has the full set. As you can see, a great deal of thought has gone into the Undine Art Revamp, beginning with a re-evaluation of what we had, followed by reference gathering and establishing our goals, then concepts, and finally – asset creation. For ground, we wanted to clean up the mechanics of the Undine and modernize them, to make them feel more in line with our critter design in recent years. 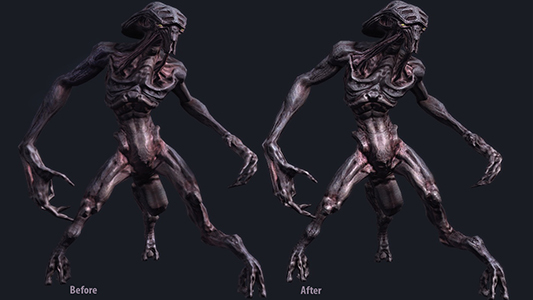 We generally cleaned up the group; they had a lot of VFX noise and redundant powers, we also simplified them a lot, removing claw swipes and attacks whose areas of effect were not clear, while improving the visual language of all that remained. Their ground powers received all new FX, and each ground critter was differentiated into either a weapon user or a psionic power user. Their character model should tell you a lot about what they can do, depending on if they are psi, have a wrist gun, or have wrist blades. We also updated their weapon type to be an Undine-unique energy beam, instead of standard Antiproton bolts. The boss even has a wrist mounted “mini-planet killer” weapon. 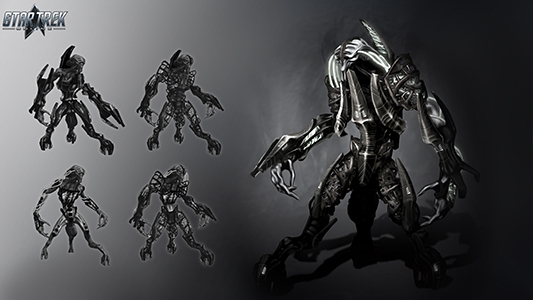 The Undine now attack using Wrist Blades, Wrist Guns or Psionic Attacks. The ground Undine received lots of tuning/balance . We removed their self-heals, but gave them all a passive Regeneration Effect, so be sure to focus your attacks for maximum effectiveness! 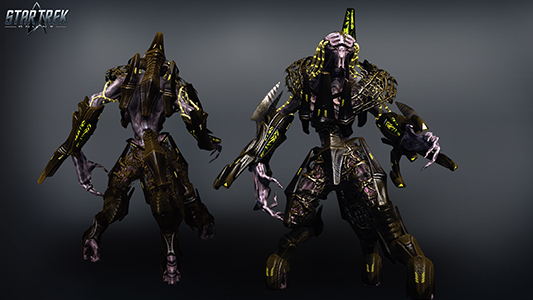 They also have no shields, providing a unique feel in combat as their health is more resilient than that of most creatures to compensate, encouraging the use of weapons that are good against hitpoints instead of shields. For space, we wanted the Undine to feel more like they did in Voyager. We updated many of the ship models so they more accurately reflect the show. The main change is the standard Bioship is no longer the group’s Cruiser, as its size was never right for that role. The IP ship is now the Frigate rank and a new, more menacing version of the Cruiser rank. The Battleship and Dreadnought models and names have remained unchanged. The display names for all the ships have also been updated. 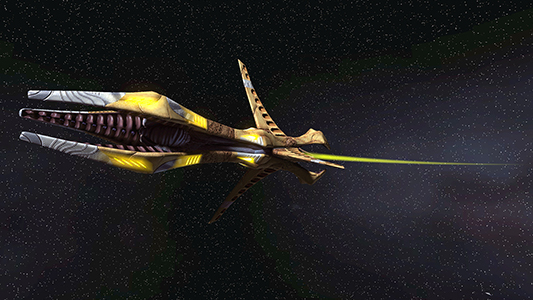 Finally, there is a new Planet Killer ship that has a chance of spawning in Undine encounters. It looks and feels just like it would in the show (well, except it blows up ships instead of planets). You’ll know it when you see it. They have a forward facing Heavy Beam attack. They are fast, with Hull Damage Resistance, Hull Regeneration, and Heavy Damage Weapons, unique to the Undine. Their old plasma torpedoes have been replaced with a Bio-plasmic Warhead. Organic in nature, this projectile slows you and can drain your engine power. The whole critter group has had lots of tuning/balance. All of their beam attacks can knock your ship – inspired by a near-miss from an Undine beam knocking Voyager off-course. 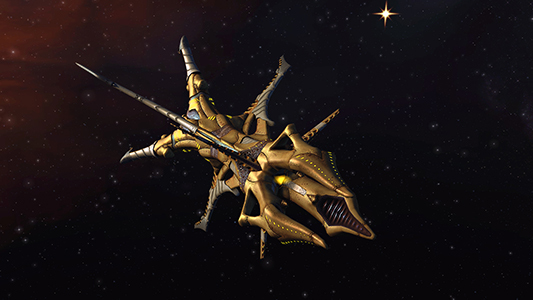 We really wanted to double-down on the Undine as a fearsome enemy group, and we wanted to fix how underwhelming their first incarnation in Star Trek Online had felt. In conjunction with the art and story work that’s gone in to revamping the Undine, we hope this critter group overhaul succeeds at honoring one of the coolest, most alien species encountered in Voyager. We hope the insight into our process has been informative, and we hope players find the visual revamp as exciting as we do! See you in the final frontier, Captains!